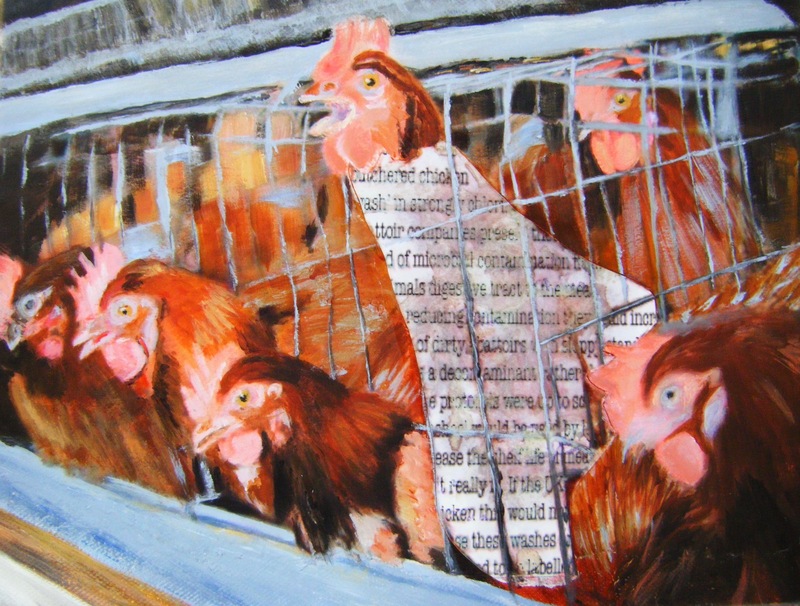 Art can aid valuable awareness and understanding of issues. Successful thriving of the Human species could potentially create its own ultimate downfall; this is a paradoxical issue that derives from overpopulation. In 1950 World population was 2.5 billion, rising to to 6.5 billion in 2005 and if current growth rates persist, it is estimated to go beyond 9 billion by 2050. Advances in living standards, medical science and nutrition, among other factors, have aided both post-natal and senior longevity and in its consequence, geometric population growth is now fast exceeding a sustainable food supply. Advancements in technology have aided increased agricultural output yet at a cost to social and environmental welfare. Rapid turnover of animals raised for meat and dairy products maximise profitability but many livestock are kept in appalling overstocked barns. 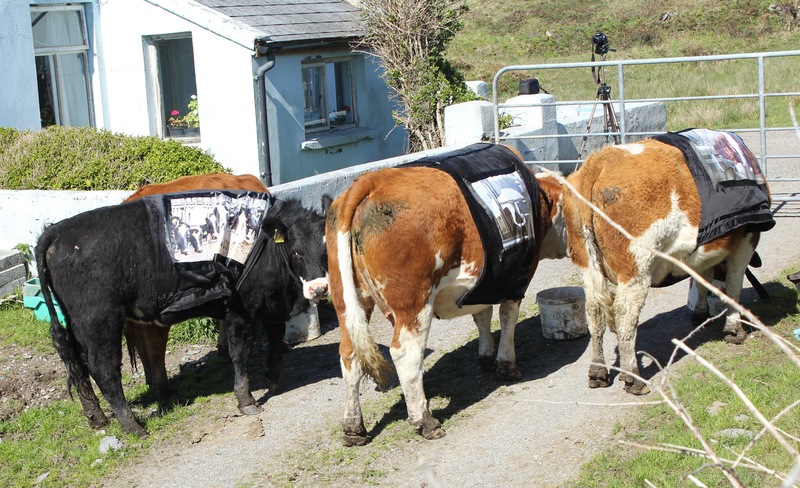 They are fed on silage and meal and routinely injected with antibiotic and growth hormones. Our Oceans provide an invaluable source of nutrition, yet they are constantly under intense pressure to provide enough food to feed increasing human demand. Selective over fishing of popular species, discard and by-catch alongside pollution are among some of the main factors which are exacerbating a rapid decline of the marine ecosystem. Nature can however be resilient, and through human awareness of sound conservation management practices, our lands can regenerate through biodiversity and our oceans will become cleaner with marine species allowed to mature, reproduce and thrive again. We must therefore learn to respect our precious environment, curb our greed and we will ultimately be rewarded with sustainability. Triple Bottom Line is a concept that seeks to advance the goals of sustainability, extending the main focus of business practice beyond profits to include social and environmental issues. ‘TBL’ explores the food sourcing systems that are destructively impacting the welfare, biodiversity and future sustainability of social and natural environments. 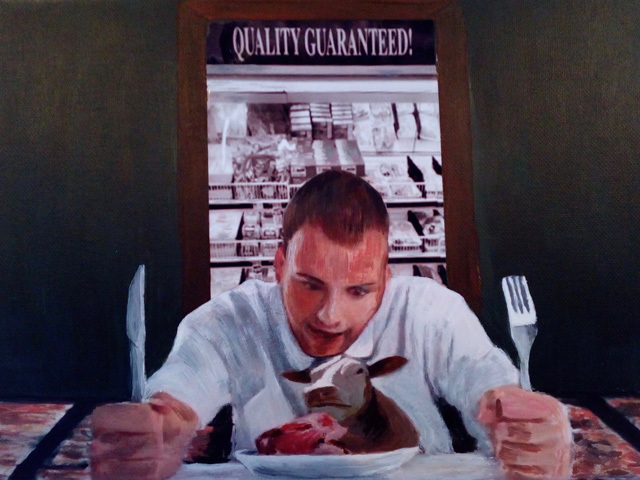 Using mixed media, satirical narratives interrogate the welfare implications around current industrialised farming and fishing practices. Through artistic research processes, including video, textile and painting, corporate interventions are exposed and challenged. A short animated video offers a sequence of digitally manipulated images to convey the demise of aquatic species caused by overfishing and plastic pollution. 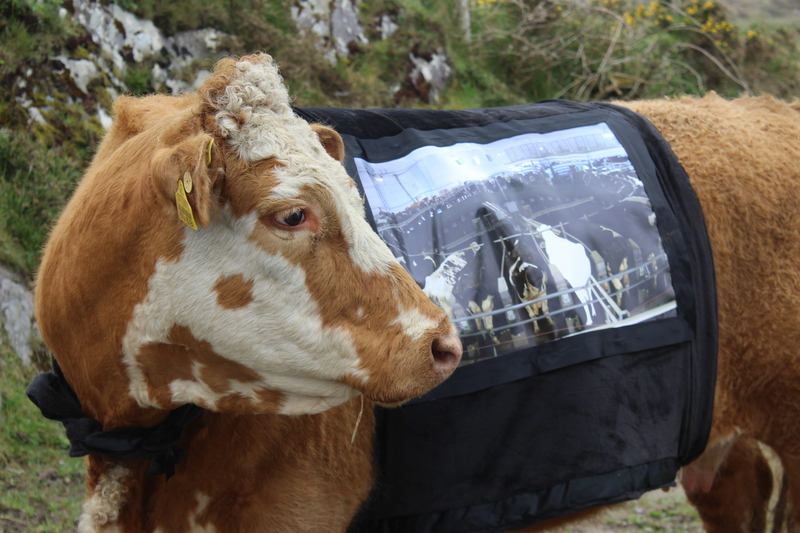 Organically raised cows wear mourning bands that display images of industrialised cattle. It is in protest against corporate commodification and welfare standards on behalf of their fellow species. 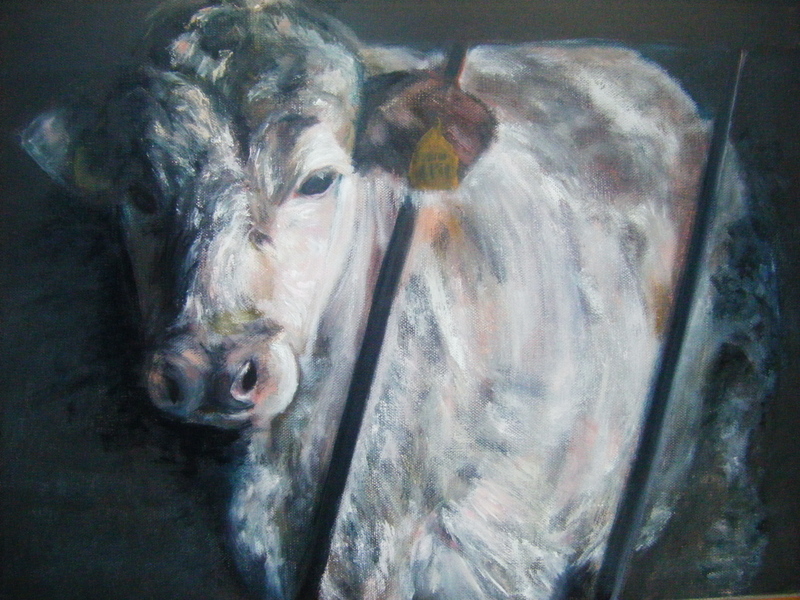 Below are a selection of paintings and photo manipulated images that depict some other issues related to Industrialised Food Sourcing. 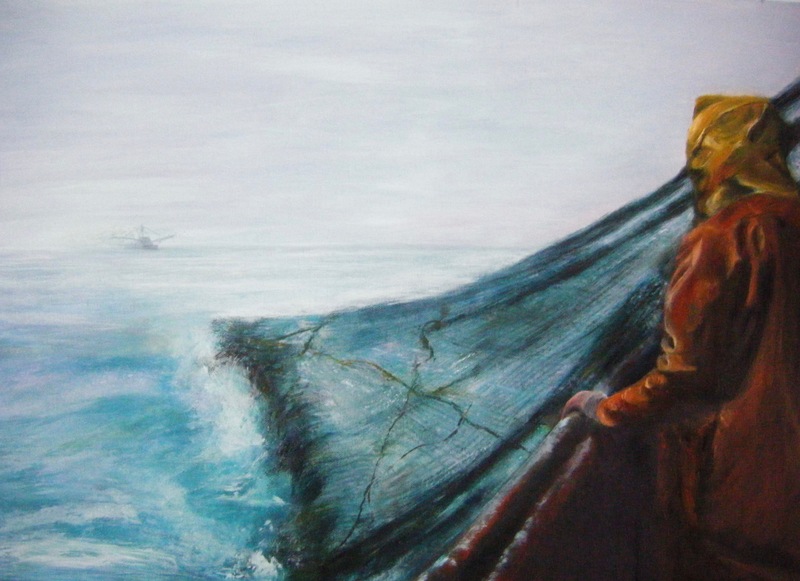 A painting of a fisherman observing a ‘factory ship’ on the distant horizon. 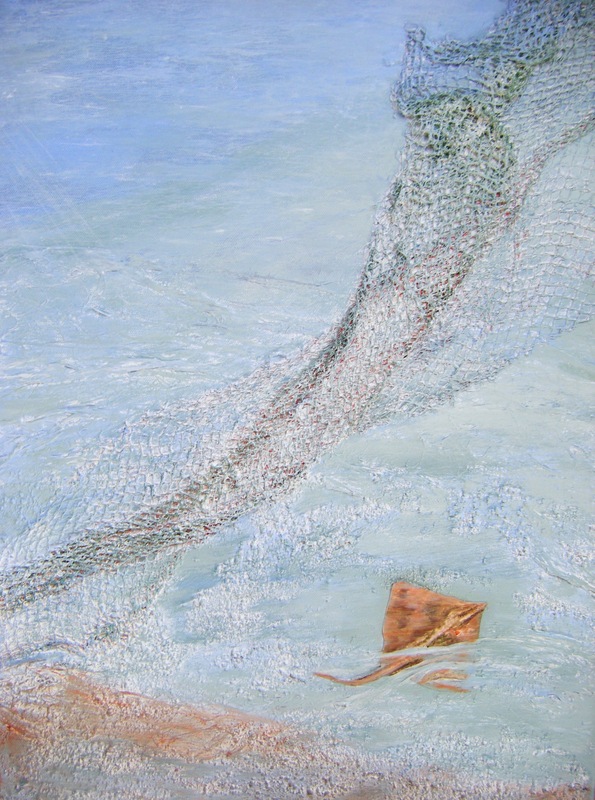 Depicting the lost and discarded nets that indiscriminately continue to catch fish and other marine life. This painting depicts farmed salmon being prone to infection by sea lice and if escapees infiltrate with wild salmon, they too can become infected. More than 80 boats in The Dutch Fishing Fleet controversially for ‘scientific purposes’ deploy electrical currents that stun marine life before catching. I created this image based upon the ‘Birth of Venus’ by Botticelli. Listed among such attributes of love, beauty and prosperity, Venus also symbolises fertility. Over-fishing of the oceans has reduced the capacity for sustainable reproduction of many marine species. It is futuristic imagery, depicts potential pollution from aquaculture; the effect of governmental fishing policies; a fisherman throwing out a net, and the skeleton of a mermaid upon a toxic mussel shell (symbolising both man and marine life). A triptych that depicts the demise of marine life by overfishing and the infiltration of plastic pollution. I recently recorded a conversation with John-Joe, an ageing bachelor farmer who reflected upon the changes he has witnessed in farming practice. He mentioned that meat nowadays does not have the intensity of flavour that it had in the past and he understood this is due to the cattle nowadays not grazing on unadulterated pasture. “You are what you eat” he quoted. 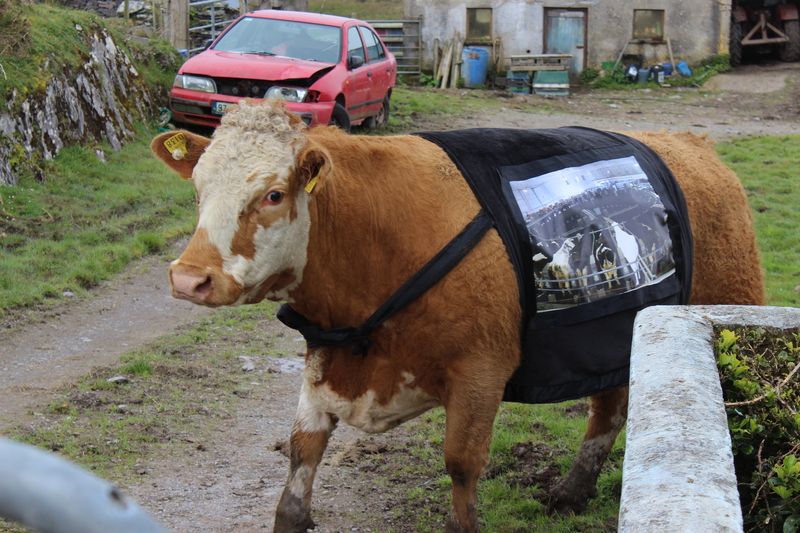 John-Joe breeds Aberdeen Angus cattle for meat production. They are well cared for and allowed to graze naturally on grass but are over-wintered in barns where they are fed on silage, and meal. 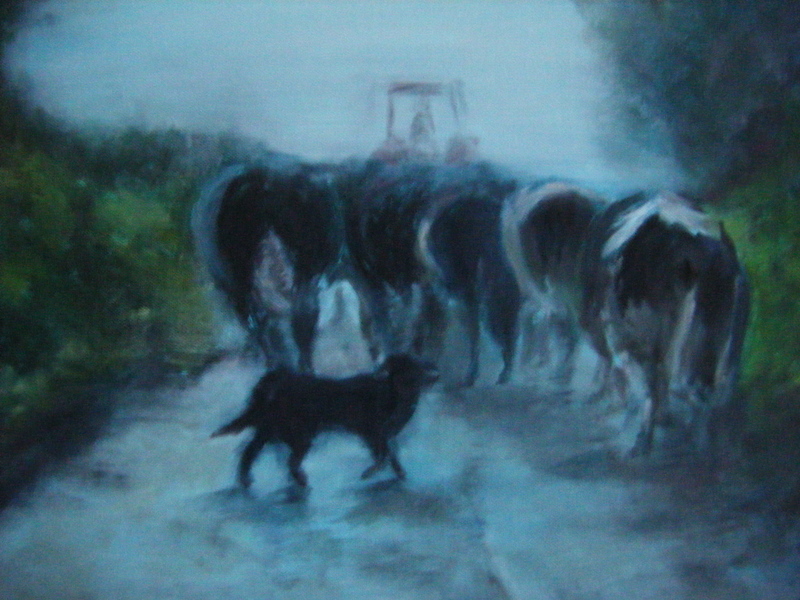 Traditionally, cattle and other animals are herded towards fresh grazing. 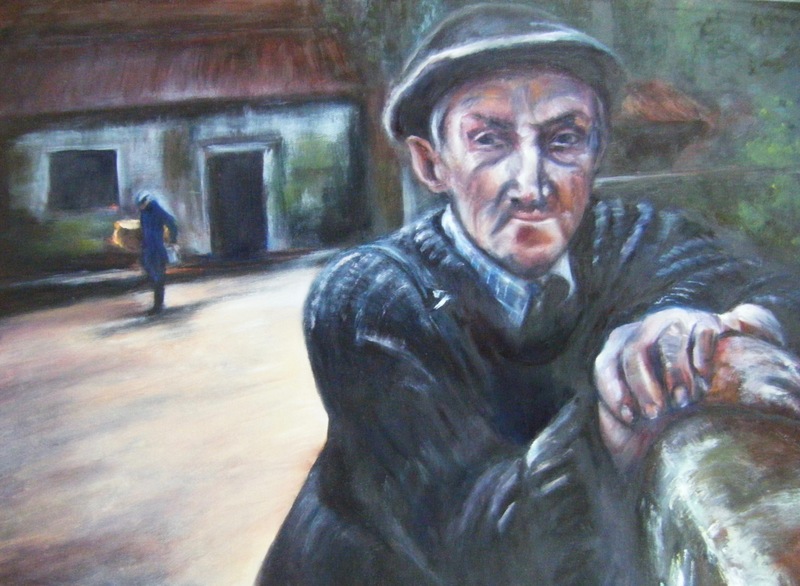 Images similar to this were once commonplace but with intensive farming practice, the cattle do not graze outside but are kept inside cramped slatted houses and fed on silage and meal. They are routinely injected with antibiotic and growth hormones. There are concerns that post ‘Brexit,’ chlorinated chicken imports from the U.S. could be allowed into the U.K. 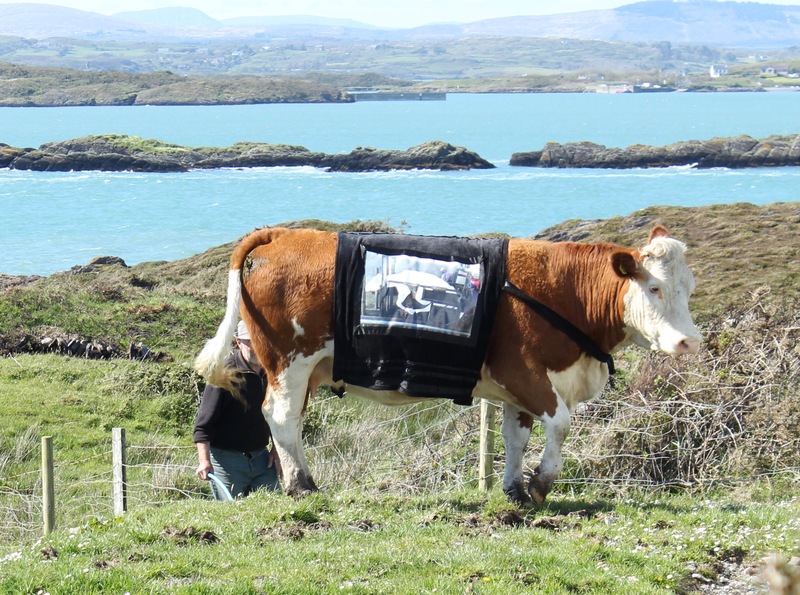 This image depicts the cramped conditions experienced by cattle during intensive farming practice and the casual disregard by consumers to how food has been produced. Many consumers purchase neatly packaged and portioned meat from supermarkets, bearing little resemblance to the animal from which it came. John-Joe mentioned that with artificial manure and sprays, red clover is killed. Traditionally, when grazing cattle ate red clover, the beef was regarded as an aid to curing some cancers. Test tube evidence has shown ‘isoflavones’ present in red clover may stop cancer cells from growing or even kill off cancer cells. 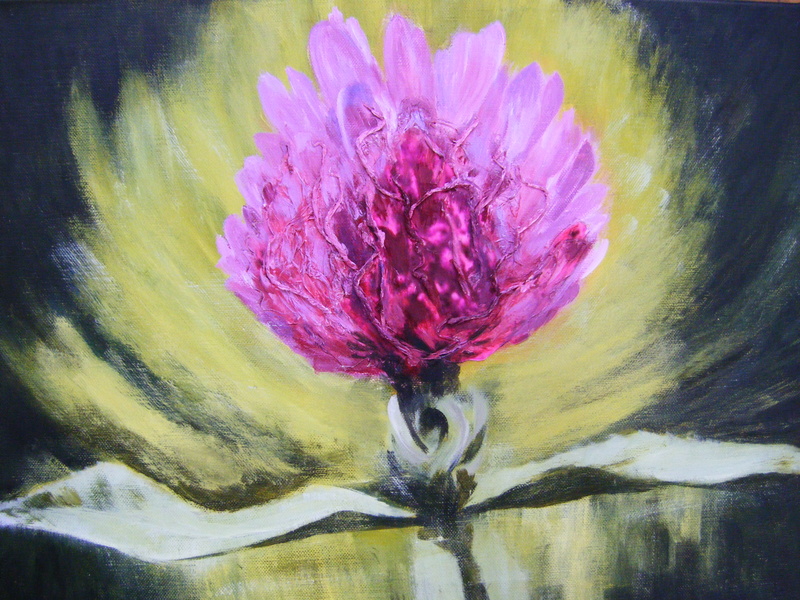 The above image of a red clover flower merged with a cancer cell depicts mutation. Hoeing was traditionally used to control weeds. 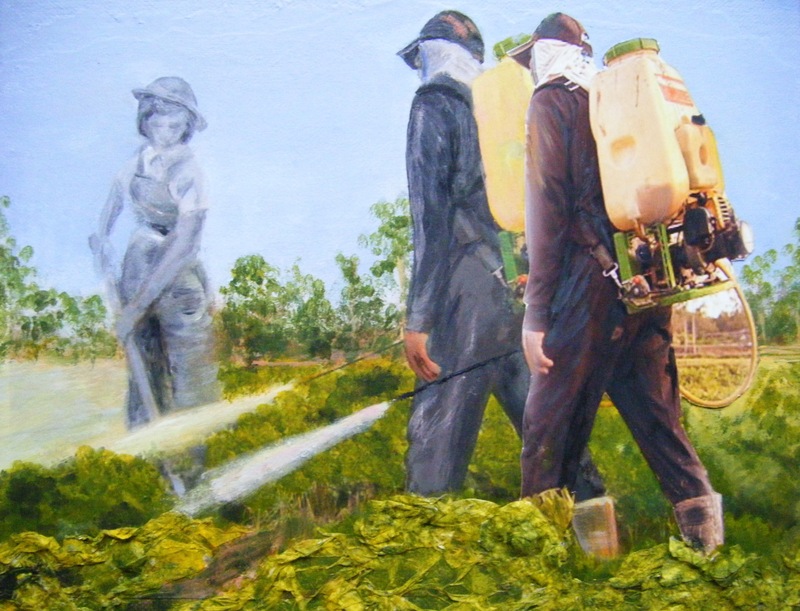 Nowadays toxic sprays are more commonly applied, threatening health and natural biodiversity. 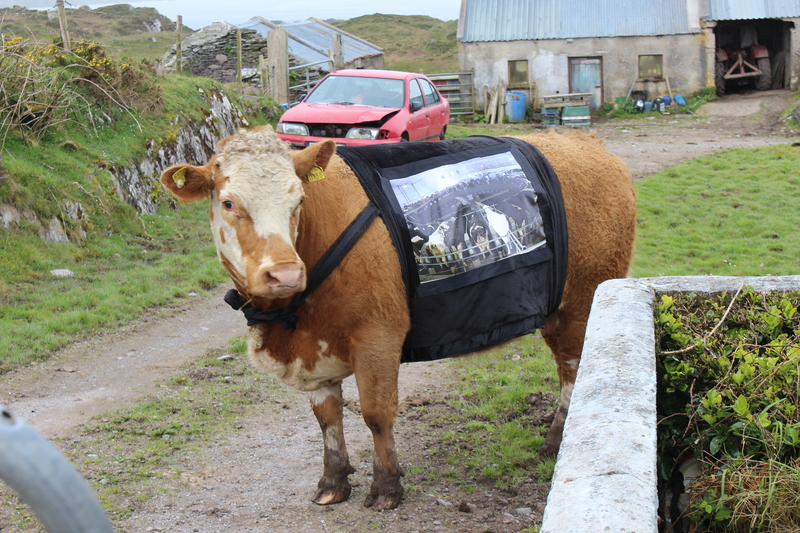 This image incorporates a ‘For sale’ sign and is merged with a slurry wagon that is dispersing polluting effluent from an intensive cattle farm. Many traditional and organic farming methods are being replaced by intensive farming practice. This digitally manipulated image is of an aged smallholder, hand milking his cow. The image was merged with a ‘for sale’ sign seen on the gate leading to a farm for development into a luxury dwelling. 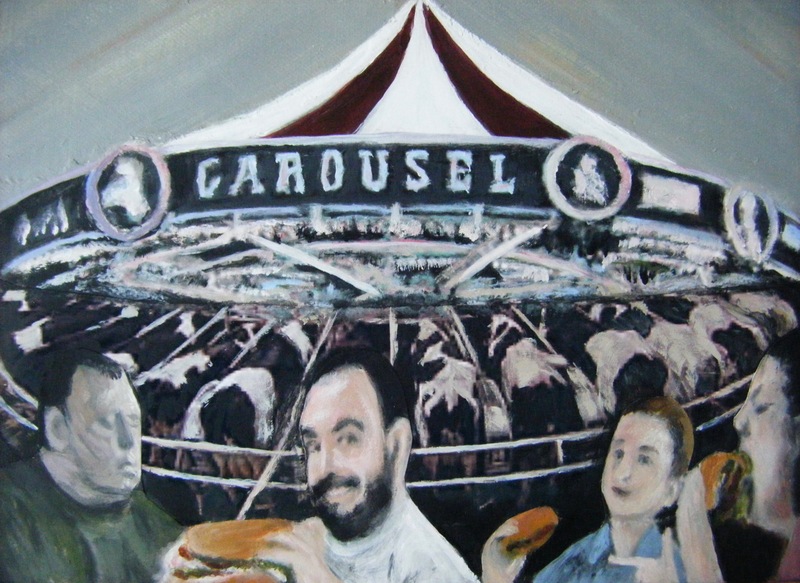 A sculptured Triptych painting represents a vast field planted with a GMO’d single variety crop. Many of the seeds planted in fields such as this are barren, which means that future stock cannot be gleaned by the farmer but must be purchased via a seed company. The crops are heavily sprayed with specific toxic chemicals to destroy weeds and pests but these toxins may also be residual in the harvested crop, the soil and can potentially leach into waterways which in turn can cause sickness whilst destroying natural biodiversity. 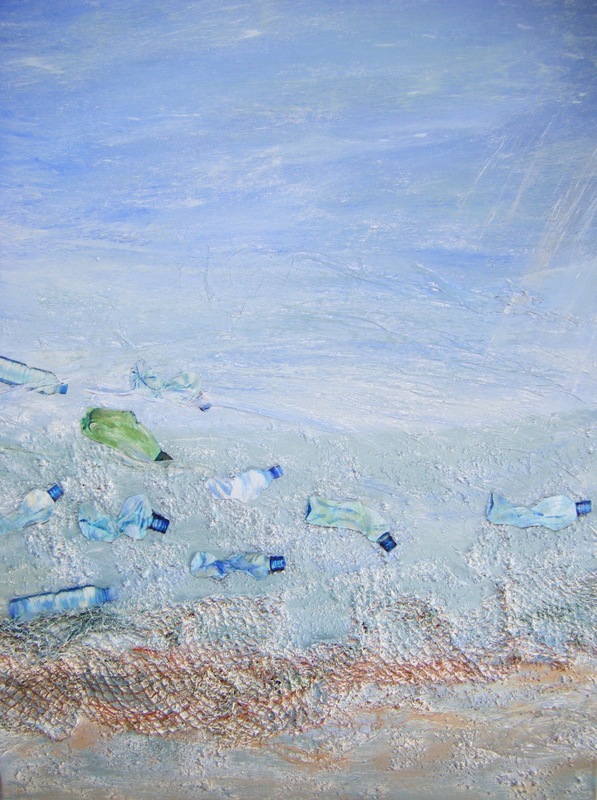 Created using strips of tissue paper pasted onto canvas, overpainted with acrylic to represent the ocean. Netting was then adhered plus a manipulated lid from a can of herrings. This is a digitally manipulated image using the skeleton of a female to which I erased the legs and added the tail of a fish. It is to show that many humans require fish for survival. These are a selection of animated stills, extracted from the second part of a short film which I created about agricultural and marine sourcing issues. 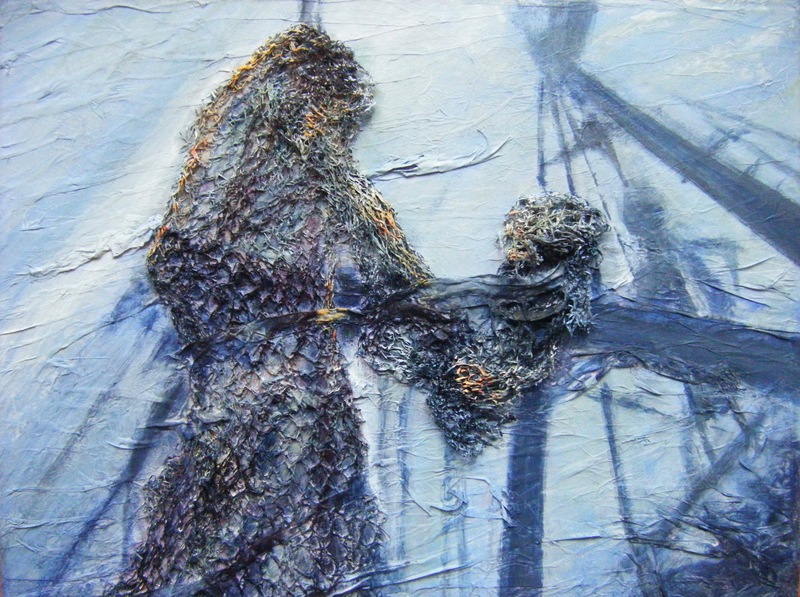 The second part is concerned by the impact of over-fishing and the consequential destruction of life within our oceans. 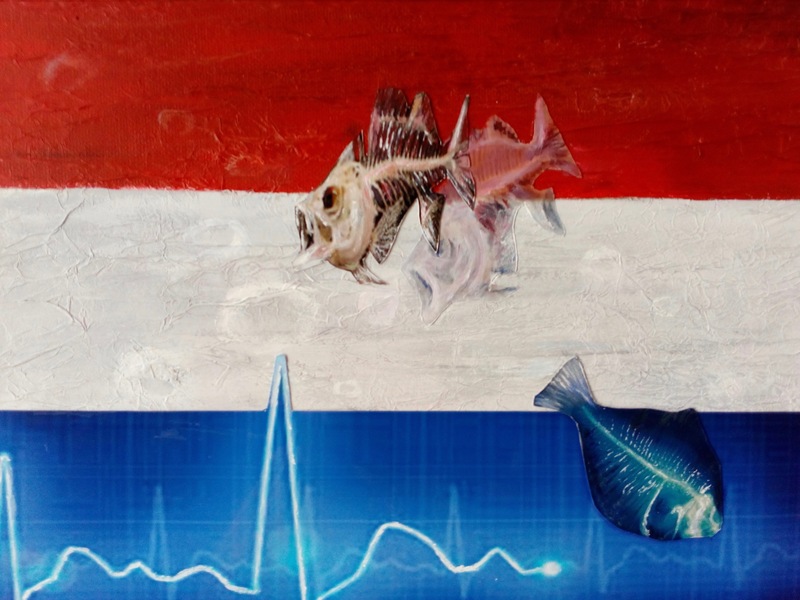 The skeleton of the mermaid symbolises both man and fish, and I have named it ‘Mermaton.’ A shoal of endangered fish species, swim erratically across ‘Mermaton.’ The Dutch fishing fleet use electrical pulses to stun fish before catching. 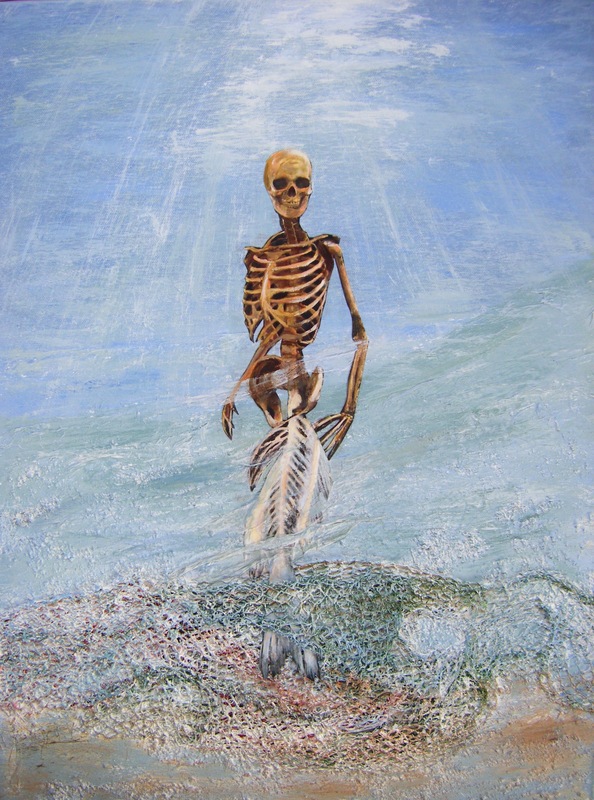 The fish numbers dwindle until a solitary skeleton remains in a barren ocean. The fish are eventually replaced by non-degradable plastic bottles. The animated section of the film includes a haunting audio recording of distressed whales and dolphins. The ‘Parlour on the Pier.’ Sunday, May 7th, 2017. I collaborated with an event that changed the shelter on Sherkin pier into a ‘parlour’ for the day. With help from several of the Islanders, myself and fellow students, Mary Scroope and Colin O’Sullivan collectively joined forces to fuse our projects in a display of works within the shelter. We invited Islanders and visitors to participate in conversation that reflected their thoughts and opinions on topics of Food sustainability, Herbal remedies (Mary Scroope) and Healthy eating (Colin O’Sullivan). Islanders Dan and Fergal helping to hang my pictures on the stone wall inside the shelter. Visitors from the mainland arrive onto the pier from the ferry. The Islanders also come to take a look . Inside the shelter, I discuss the reasoning behind the works and opinions are shared. Issue-based Montages. The first was based upon lyrics from a song by Joe Walsh, ‘Song for a dying Planet’ It explains that man is killing other species of life to a point of extinction, whilst Politicians and Corporate Businessmen, in their greed for power and wealth, are in denial about the future consequences. Fishing Nets at Schull Pier, West Cork. I love the colours, shapes and movement. A Sculpture of a fish, constructed using fish tins wrapped around 2 wire coat hangers,symbolise the Industrial fishing Industry. The fish hangs freely from a hook, affixed to the outer rim of an old bass drum skin draped with seaweed. This is to depict the global scale of the fishing crises. I used photoshop to copy, paste and re-size the ‘No Fish’ image onto a photograph of a local fish station. It looks like a large poster on the tower, stating that there aren’t any fish left to process. 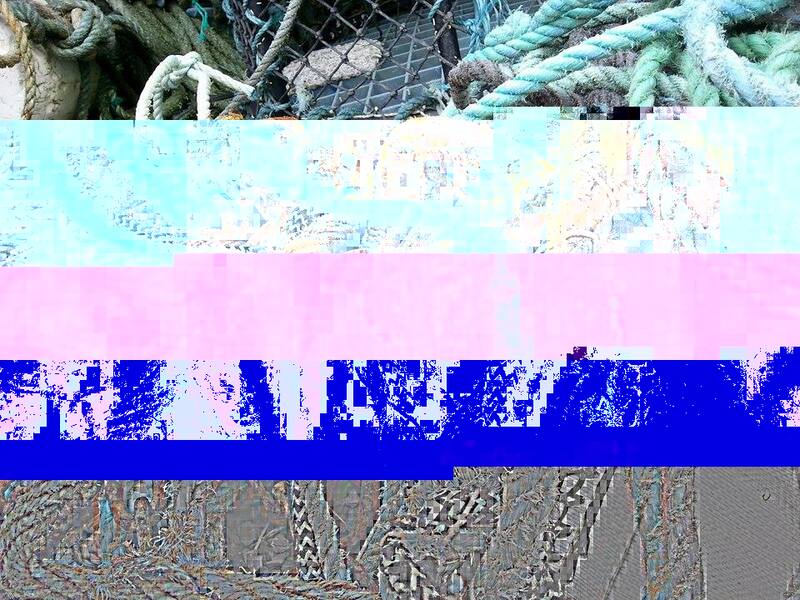 Using ‘HexFiend’ I altered the image coding of fishing nets. Interesting for a first attempt!